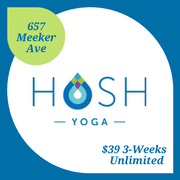 Happy Friday, Greenpoint! Now you’re really living — because the Newtown Creek Alliance has announced plans for the construction and installation of a second Living Dock within Newtown Creek. And if that doesn’t quicken your pulse, maybe the unveiling of a new staircase at the Bedford Avenue L station will. They opened on Saturday as a first taste of the MTA larger L-pocalypse repair work. But, with more stairs comes fewer parking spaces. 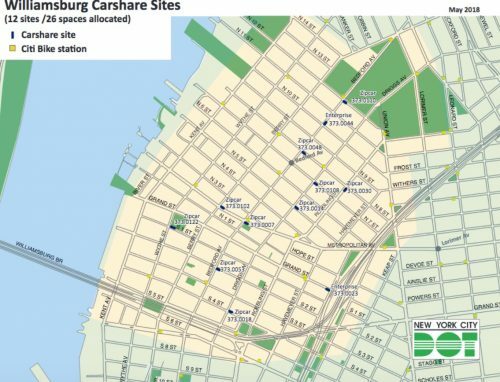 The city has reserved dozens of spots in Williamsburg as part of its car-sharing pilot program. 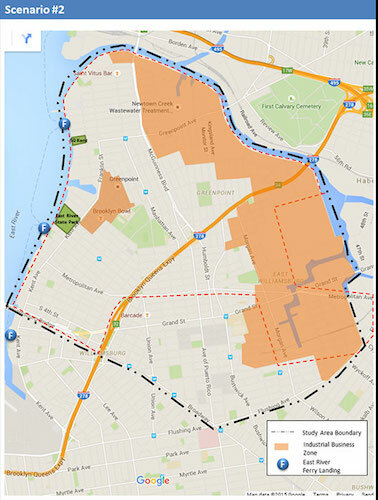 For two years, the NYC Department of Transportation has been studying traffic patterns and issues in North Brooklyn. Now they are ready to release their findings to the neighborhood in a meeting where they’ll talk about planned changes and improvements. 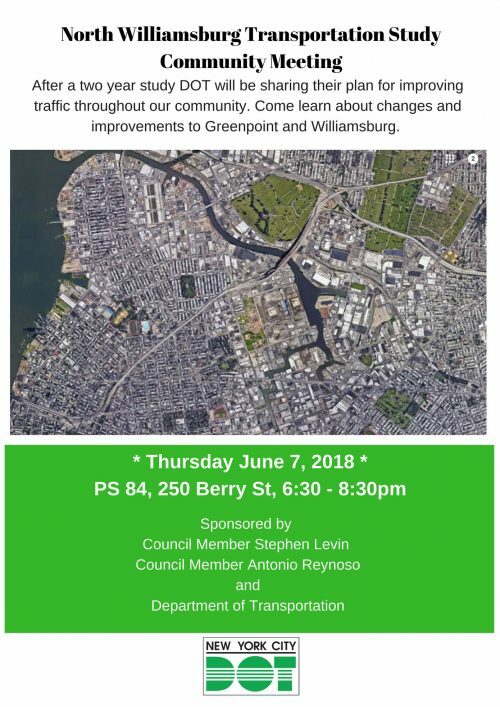 The meeting is happening this Thursday June 7th from 6:30pm to 8:30pm, at PS 84 (250 Berry Street). See you there! 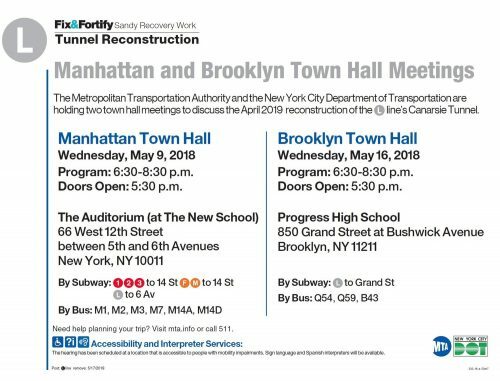 This Wednesday evening, May 16th from 6:30-8:30pm the MTA and NYC DOT are hosting a town hall to discuss L-Train shutdown plans and the impact that the closure will have on our commutes and local businesses. Part of the plan includes increasing the number of cars on the ever-short G Train (it’s about time! 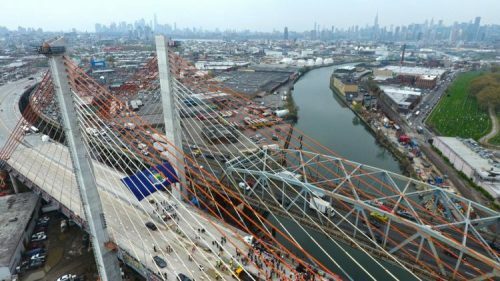 ), increasing ferry service, adding a few hundred buses to traverse the Williamsburg Bridge, and expanding bicycle access. 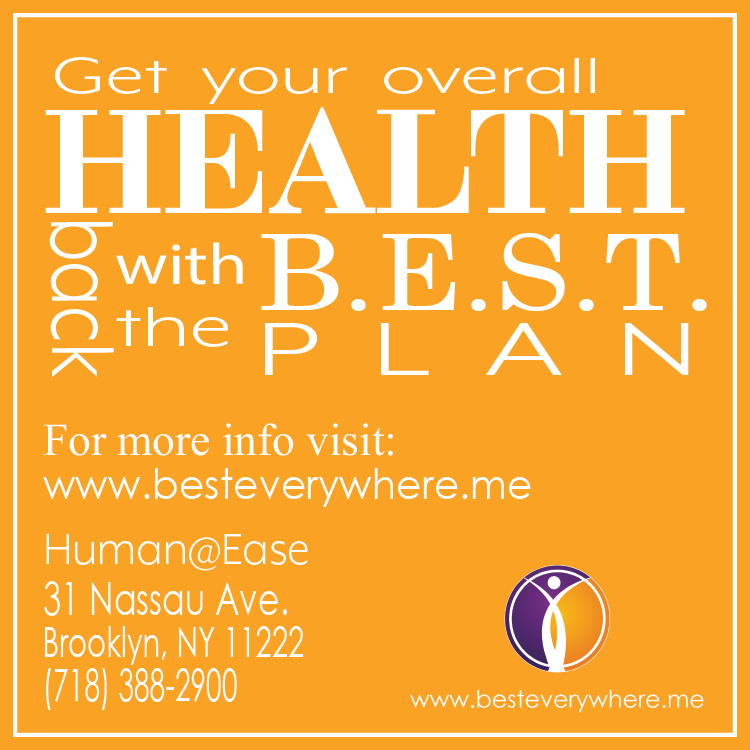 Wednesday’s meeting will be held at Progress High School (850 Grand Street at Bushwick Ave). More info can be found on the L Train Coalition’s site. The Sea Train: Will Ferries Mean Smooth Sailing Through L-Pocalypse? The MTA has seen protests in Brooklyn due to its laissez-faire relationship with the impending L-pocalypse. In response, they’ve promised to make community engagement a “central priority” as the March 2019 L train closure nears. Part of that community engagement was on display last week, when the MTA and the DOT appeared before Brooklyn Community Board 1 to offer a joint presentation to this neighborhood offering new information regarding their plans for alternate service during the transit shutdown. In a word: Ferries. 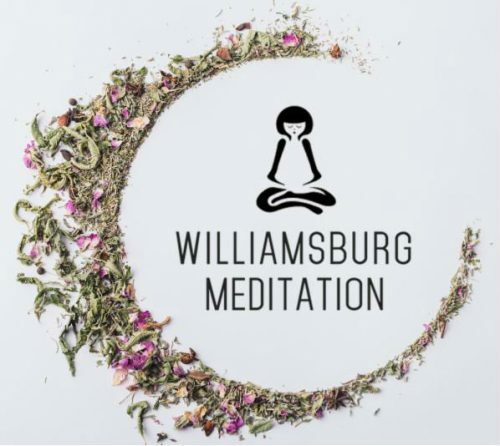 L Train Shutdown Meeting TONIGHT (2/8)! 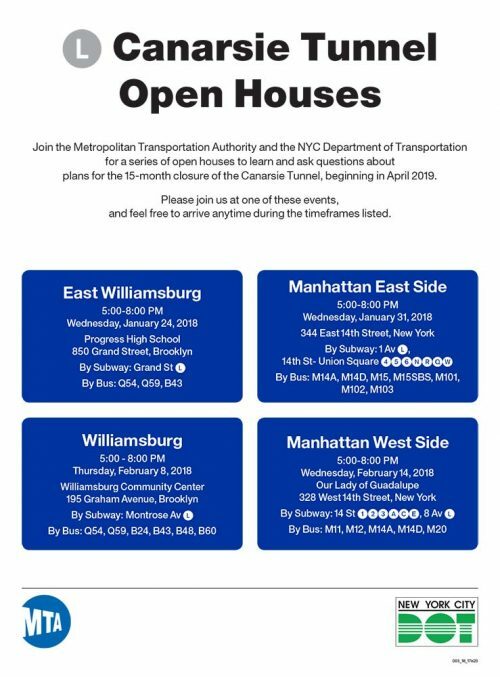 As part of their plan to engage our extremely concerned local community, the MTA and the NY DOT will be holding an open house meeting on the L train shutdown next Wednesday, January 24th. 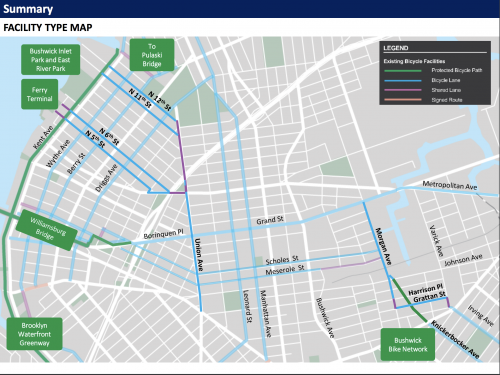 Last month, the MTA released their plans for the 15-month shutdown of the L line (starting in 2019), to the chagrin of many residents—who felt that what they’ve got in store (more buses, bike lanes, among other things) is simply not enough to fulfill needs of the 200k+ riders who use the line to travel from Brooklyn to Manhattan every day. When it comes to the Zombie Apocalypse, you’re officially covered. The Pentagon has been prepared to resist the undead menace since 2011, when the headquarters of United States strategic command compiled a “Counter-Zombie Dominance” plan. This is absolutely a real thing. The document even carries the disclaimer, “this plan was not actually designed as a joke,” but instead as “a useful and effective training tool.” Other useful and effective tools that may help you in planning for the Zombie Apocalypse include the Center for Disease Control’s Zombie Preparedness Campaign, and this handy list of the 25 Best Majors for Surviving the Zombie Apocalypse. 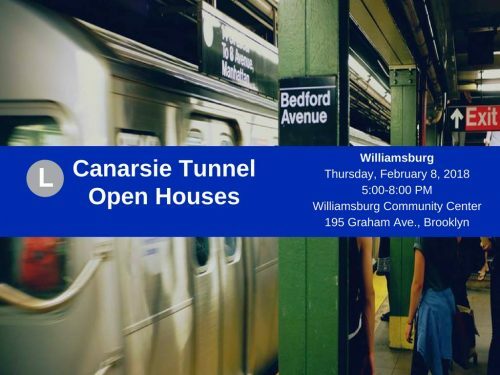 On the other hand, if you are concerned about the eminent L Train Shutdown, the 15-month transit closure planned to take effect in April 2019, when the the MTA will repair the Canarsie Tunnel, it seems you may have no such survival guides. According to The Village Voice, the City and the MTA have no plan in place for how they’ll get the L Train’s 200,000 daily riders between Manhattan and Brooklyn and back again. Potential Park Under The New Kościuszko Bridge! 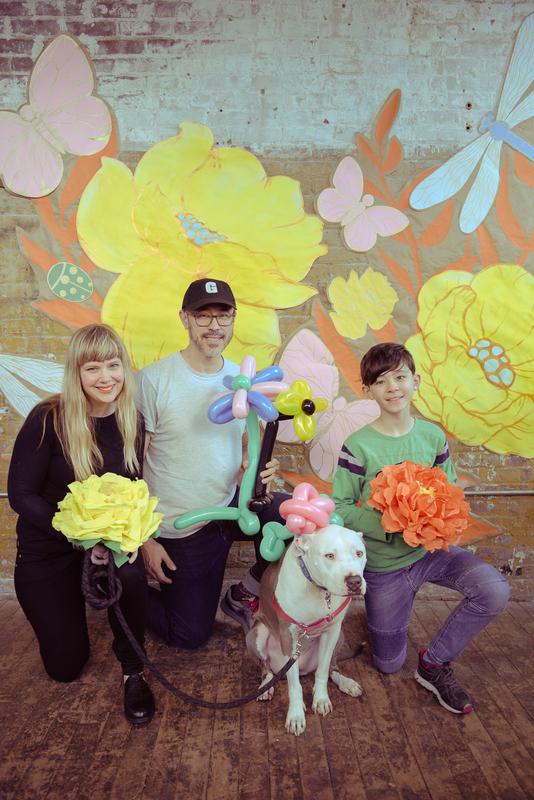 Looks like Greenpoint could be getting another park! 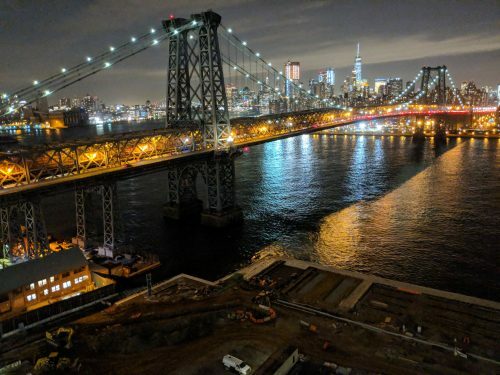 The Open Space Alliance and the Department of Transportation are holding a meeting on June 28 to offer the community the chance to give input on possible open space usage underneath the Kosciuszko Bridge. They’ll also be hosting a tour of the proposed park site on June 24th, but the tour is capped at 25 people and currently full.